There’s a very real reason the feudal systems have remained in our social consciousness since the ninth century. Take as an example the frow, the mother of all non-political non-manorial feudal systems. 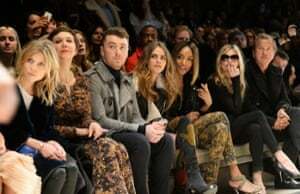 The term frow is a portmanteau of front row, in the fashion show sense. It also, confusingly, translates as Dutch woman or, pejoratively, as freak show. But let’s stick with the former. In this fashion sense, the frow is the front row that lines the catwalk, a great place to see or be seen, like the Met Bar in the 1990s, or as Saatchi found rather less luckily, a table outside Scott’s. One of the best frows to be seen on is that at the Burberry show, which is littered with A-listers. The frow was created as a tool of hierarchy. As Hadley Freeman, a regular former fashion week frow-er, scrow-er (second) and throw-er (third) testifies, if you’re not on the frow it’s highly likely you don’t exist: “It is as hierarchical as the most feudal of medieval courts”. But what was once the preserve of fashion weeks has now spread into other lite activities such as exercise classes or basketball courts both of which, it transpires, has their own version of a frow: VIP areas (seats or otherwise) which have become highly coveted purely for the status which they bring the occupant. No two frows are the same, as I discovered, long before I started working on the fashion desk, when I reviewed gigs. A few years ago I was sat front row in the Nottingham Trent FM Arena at what turned out to be Whitney Houston’s final tour. The front row was populated by devout fans, various Houston family members and teenagers, who had all paid over £100 for a ticket. Except they hadn’t. As one woman in a wheelchair holding a plastic peel-top wineglass told me, half the tickets hadn’t been sold, prompting various members of Houston’s entourage to trawl the streets of Nottingham offering free tickets to fill the seats. The girls next to me were apparently given their tickets in the Tesco Express down the road. Sometimes, explained a spokesperson, instructors will ride in the front row “to set the tone”. Style consultant Katherine Ormerod has attended several classes and can vouch for this: “newcomers hide wisely at the back” she says. 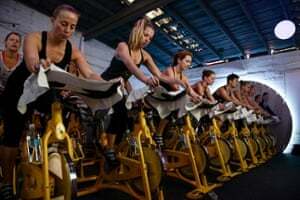 “It’s worth noting that the instructor is always looking for slackers and like boot camp will shame you for your lack of dedication. Plus you don’t want to look pathetic in front of the lithe ladies in Lycra ahead of you. So you keep going.” Such is the power of this frow that BoomBoom Athletica have brought out a pair of ‘Front Row Spin Leggings. Truly the stuff of parody, or so thought Tina Fey when she wrote the excellent Unbreakable Kimmy Schmidt and dedicated an entire episode to “SpiritCycle” in which Kimmy and Jacqueline vie for a space on cult leader SpiritCycle instructor Tristafe’s coveted front row. In Comedy Central’s Broad City, too, Abbi works at a gym called “Soulstice”, a knowing pastiche of the cycle class. Not dissimilar to the fashion frow is the brow – or basketball front row – a hotbed of A-listers, the importance of which will peak this weekend during the NBA play-offs. In order of babeness, you should spot: Beyoncé, Jay Z, Kim Kardashian, Kanye West, Kate Middleton, Katy Perry, Cameron Diaz, Justin Bieber and Larry David (flip the list round if you’re after a GSOH order). 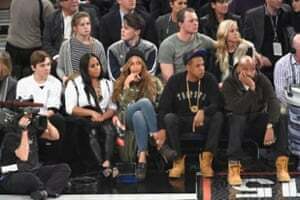 Key games are the home fixtures for the LA Lakers or New York Knicks, because that’s where famous people live. The brow is an interesting counter to the frow, in that the view is terrible. Viewers regularly cite whiplash, confusion and sometimes actual, physical pain caused by flying balls. Tickets, of course, are also comically expensive, so there’s very little tangible evidence to explain why they are so coveted. One reason is the kiss cam, wherein a camera singles out snogging couples, making it the ideal place to showcase your new romance. You know, in case TMZ is having a fag break or something.